Lummi’s shellfish hatchery grows its own algae to feed millions of geoduck, manila and oyster seeds. The Lummi Nation’s shellfish hatchery is adding an all-night feeding system to its algae-growing operation. For years, the hatchery has grown its own algae to feed growing manila clam, geoduck and oyster larvae. The new system installed this winter consists of 60 algae-filled bags in glowing Gatorade shades that pump directly into the raceways. One of the hatchery’s three geoduck systems consists of 11 raceways that hold about 6 million geoduck seeds, which can go through 30,000 liters of algae a day. The geoduck operation has a total of 20 raceways when all three systems are online, having expanded from five raceways since 2010. The expansion has provided new job opportunities. In addition to eight full-time staff, AmeriCorps provides five employees for 20 hours each week, and two tribal members have been hired through the Dislocated Fishers Program, which helps fishermen earn a living between fishing seasons. The shellfish hatchery used to support itself through seed sales until the Lummi Nation took over operating costs in exchange for manila clam and oyster seed to enhance the reservation tidelands for tribal harvest. Only the geoduck seed is sold commercially. Concerned about increasing water temperatures as a result of climate change, some of the geoduck seed customers, which include the Squaxin Island Tribe, have started seeding their beds earlier, which required the hatchery to spawn geoducks a month earlier. 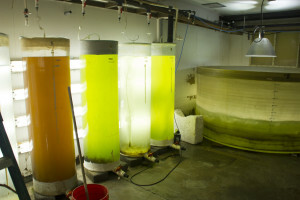 This entry was posted in Environment, Local News and tagged algae, algae-growing, all-night feeding system, clams, Geoduck, Lummi Nation, shellfish hatchery by Kim Kalliber. Bookmark the permalink.